Shelly Rosamilia of Lunch Ladies Book Club podcast reviews Red Rain by David Beers. What did she think about it and does it match with your review of the book? 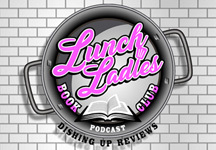 Lunch Ladies Book Club co-host Shelly Rosamilia is joined by Michelle Rocco in this special episode. Did they love it? Hate it? Did she love it? Like it? Maybe she wasn't a fan of it at all? Find out by actually listening!